Once upon a time, I decided to avoid cleaning the house by letting my oldest get it a little messier. That’s where this flour activity started. I’ve actually been working on this particular post for a while. Unfortunately, on top of everything else going on, my kids have been taking turns getting sick. My youngest was just starting to sleep through the night before this, so I’ve been missing the extra sleep a little bit more than usual. She’s doing better now, though, and I’m now trying to catch up on life again. 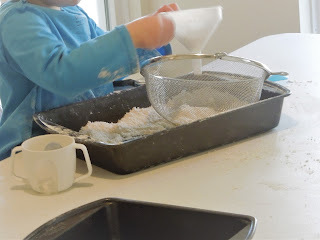 As a result, the kids have gotten to play with their flour this week, since it keeps them occupied for 20-30 minutes at least without a lot of supervision. Clean up, on the other hand, is a bit more hands-on!